This virtual exhibition consists of mathematical objects that are visualized in the computer. It shows relations between Mathematics, Art and Computer Graphics, recreating and expanding a previous exhibition. 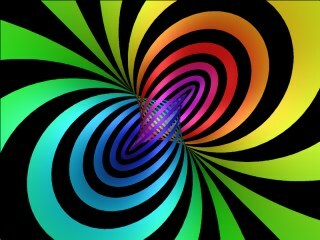 Its images try to suggest geometrical intuitions evoking the mathematical notion of dimension. One of goals of the World Mathematical Year is to emphasize the role and the importance of this millenary science and its applications in the Contemporary World and Civilization. Beyond its role in Science, in Technology, in Economics and in many other fields, is not too much to accentuate its cultural importance in our conception of space-time and in its relations with the Art. To communicate and to popularize Mathematics is one of the great and difficult challenges facing not only mathematicians but also mathematics teachers. If to show is to communicate, a mathematical exhibit, dealing with abstract elements, such as number, shape, probability or algorithm, which is often difficult or even impossible to realize physically, should stimulate and rouse the imagination, the discussion and the curiosity of young people and the general public. Using geometrical intuitions and images or movement of lines, surfaces or other physical objects, it is possible to evoke mathematical notions such as length, area, volume, symmetry, space and... dimension. This exhibit of high visual quality that is currently realized, advertising, recreating and expanding a virtual exhibit that exists in the cyberspace inhttp://www.math.brown.edu/~banchoff/art/PAC-9603/, allows the visitor to relate Mathematics, Art and Computer Graphics, showing the potential of new information technologies and of computational geometry for the communication of Mathematics. The notion of dimension, that our intuition easily captures when we think of the sequence point-segment-square-cube, is a mathematical concept of deep meaning and of great consequence, not only in our conception of space-time, but also in many other fields of the human activity. For example, degrees of freedom or independent variables are notions that go far beyond the simple three dimensions (length, width and height) of the physical space in which we live. The exhibit Beyond the Third Dimension takes the title of the book of Thomas F. Banchoff, a classic of the "Scientific American" collection, evoking geometrical objects, computer graphics and the concept of "Dimension". This exhibit is composed of twelve surfaces and small movies representing aspects and properties of virtual geometrical objects in three and four dimensions and also two new pieces on the hypercube. The contents of this exhibit, essentially created in 1996 and rebuilt in virtual form in the following year, was designed by Thomas F. Banchoff, professor of Geometry at Brown University, USA, in collaboration with some of his students, mainly Davide P. Cervone, currently at Union College, in the state of New York, who added the pieces about the cube and the hypercube, as well as a short introduction to higher dimensions. The exhibit currently shown is much more that the bilingual version of Surfaces Beyond the Third Dimension, that was shown in 1996 at the gallery of the "Providence Art Club". It is also composed by the panels and the physical support recreated with art by the "Atelier Henrique Cayatte". But, above all, the exhibit is constituted by the mathematical objects which can be visualized by computer graphics, the virtual elements that were recriated by Davide P. Cervone and completely processed by computer by "Arte Numérica". The itinerant version of this exhibit, that the medieval town of Obidos and the modern city of Funchal show in a concerted response to the challenge that the Information Society presents in the dawn of the new millennium, is just a mirror and an advertisement of the authentic exhibit "Beyond the Third Dimension", that may be found in cyberspace and seen in the CD-ROM of this catalogue and in http://alem3d.obidos.org/. The Centro de Matemática e Aplicações Fundamentais of the University of Lisbon takes part in the World Mathematical Year 2000, by promoting this initiative in the field of communication and popularization of mathematical sciences, in the framework of its project Matemática em Acção, in collaboration with the Town of Óbidos, the Department of Mathematics of the University of Madeira and the Sociedade Portuguesa de Matemática, and with the support of the Programa Ciência Viva of the Portuguese Ministry of Science and Technology. An Introduction to "Surfaces Beyond the Third Dimension"
What is the best way to display a variety of surfaces in such a way as to encourage many people to interact with them? Stage an exhibit. In March of 1996, the Providence Art Club, one of the oldest such clubs in the country, hosted the show ``Surfaces Beyond the Third Dimension'' in their Dodge House Gallery. The first incarnation of that exhibition was for two weeks, and the gallery book includes the signatures of dozens of visitors, including artists, students, and mathematicians. The physical exhibit has long since been dismantled, yet the show lives on as a virtual experience and we still receive comments in the on-line guest book. The Dodge House Gallery has a square base and one interior partition, providing well-lighted wall space for twelve large photographic reproductions of computer graphics images as well as an alcove for display of a continuous videotape featuring two three-minute videos. There was a guidebook that gave information about the nature of the objects, including technical descriptions of the software and hardware used in the design of the objects and the Ilfochrome process used in their reproduction. Additional pages gave mathematical descriptions of the various pieces, as well as references to places where they had appeared either in research articles or as illustrations in books and journals. There was also a well-attended afternoon gallery talk, describing the origins of the project and including a guided tour of the exhibit. All of these aspects of the physical exhibit are enhanced in the virtual counterpart. In a certain sense, the on-line version contains much more than the original. To what extent does it capture and augment the experience of those who visited the actual gallery opening, and came back to see and respond to the images on the walls? There are many questions raised by this means of portraying mathematical art and design, and we will address some of them now. What is it that we are showing? Most of the images included were originally studied as abstract geometric constructions given by parametric surfaces in three- and four-dimensional space. In some cases, there is an elaborate theory behind the illustration, whereas in other cases, the phenomena are not yet well understood. In several instances, the display itself represents an innovation not only in the method of displaying a surface but in representing its mathematical properties in a way that suggests new results. Visitors to the virtual exhibit can read about the mathematics behind any of the images via a link from the main page for the image. It is clear that this electronic gallery faithfully reproduces a great many of the aspects of the actual exhibit, while altering the experience in other ways. In some cases, the electronic version loses information, while in others it provides the opportunity for significant enhancement, particularly in satisfying the viewer's curiosity about the different parts of the mathematics and computer science that made it possible for us to produce these works. We are grateful for the opportunity to present our work in a way that will continue long after the physical exhibit has given way to the work of other artists, and we look forward to further responses from visitors to our virtual gallery. Despite the fact that good mathematical software exists, the production of high-quality computer images and movies is still a difficult and time-consuming process. We used a variety of tools to produce the pictures for the gallery show. The "Torus Triptych" was generated using a program called fnord developed at Brown University, but not generally available to the public. 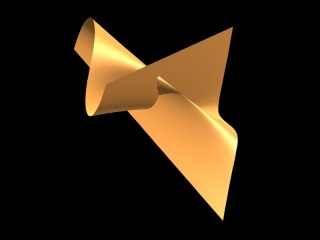 The "Triple-Point Twist", "In- Outside the Torus" and "Math Horizons" images were created by an ancient piece of custom software for SGI workstations developed by Nick Thompson as an undergraduate at Brown University. Remarkably, it still runs beautifully after more than 10 years without maintenance. The three images in celebration of Dirk Stuik's 100th birthday were generated at the graphics laboratory at Brown University. The remaining images were produced using geomview, which is distributed as freeware by the Geometry Center, though it runs only on unix workstations. The MPEG movies that are part of the interactive gallery were created using geomview and its associated StageTools modules. The images were produced first as high-resolution TIFF files, but some post-processing was done after creation (e.g., combining the separate images to form the necklace and tetraview sequences) with a variety of image tools on both the unix workstation and on a Macintosh. These tools included the ImageMagick library under unix, and GraphicConverter on the Macintosh. The final results were printed as Ilfochrome images at 20 by 24 inches and mounted on foam-core. The images in "Torus Triptych" were arranged so that the 20 by 24 prints could be cut in half and joined end-to-end to form 12 by 40 or 10 by 48 panels.